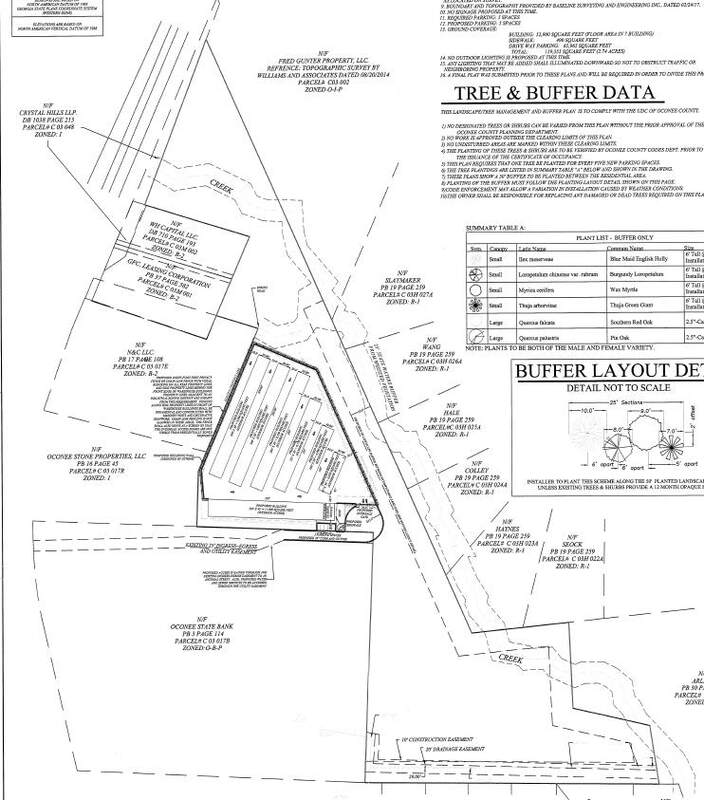 Jason Lawson, representative of Rhino Storage on U.S. 441 north of Watkinsville, was before the DRC last month and similarly received approval of his Preliminary Site Plan. Both entities have the option of asking the Oconee County Board of Commissioners to waive the moratorium. Briarwood Baptist Church received approval from the Board of Commissioners late last year for construction of a 12,000-square-foot-building to be used for a worship center and educational space. The plans before the DRC on Friday were for that 12,000-square-foot building, which would be in addition to the existing main building and modular unit used for youth education and fellowship. The county’s Development Review Committee provides technical reviews of zoning applications, construction plans and other related matters. The church expansion would be on a previously wooded lost to the west of the existing facility. Total acreage for the church property, which is at the corner of Hog Mountain Road and Robinhood Road, is a little more than 17 acres. According to a letter Weinel sent to Jeff Carter of Carter Engineering Consultants, 3651 Mars Hill Road, on April 13, the church cleared a portion of the lot of trees in February. Carter is representing the church in the expansion. The cleared lot fronts on Hog Mountain Road and adjoins property already cleared that is part of the commercial component of the dormant Parkside residential and commercial complex, which stretches from Hog Mountain Road to Mars Hill Road. The county is waiting on a letter from Carter Engineering Consultants, 3651 Mars Hill Road, requesting that waiver by the Board of Commissioners, Weinel said. 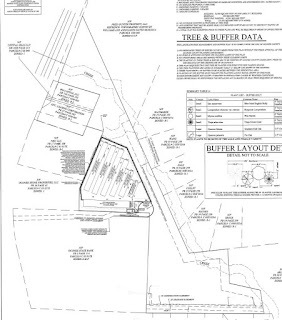 Broome Street LLC, 1251 Overlook Ridge Road, south of Hog Mountain Road in the west of the county, is planning to build a six-building storage facility on part of a 12-acre parcel of land tucked behind the Stone Store on U.S. 441 at the intersection with Hog Mountain Road. The parcel, purchased, according to county tax records, by Broome Street LLC in October of 2016, will be accessible via an easement on the property housing the operations center of Oconee State Bank, 7920 Macon Highway (U.S. 441). According to Georgia Secretary of State Corporate records, Broome Street LLC is owned by Harrison Tyler McClure, who also owns All About Pinestraw, 73 North Main Street, Watkinsville. The storage facility is to be called Rhino Storage. The storage facility is across a creek from homes on Chaddwyck Drive, off of Lavista Road. At the DRC meeting on March 17, county Building Inspector Paul Smith asked Jason Lawson of Baseline Surveying and Engineering Inc., about that order. Baseline, 1800 Hog Mountain Road, east of Butler’s Crossing, is representing Broome Street LLC on the project. On April 12, however, Weinel wrote to Lawson saying that clearing of a portion of the lot had occurred on Feb. 8, and that a three-year moratorium on issuance of a permit for the project is now in effect, ending on Feb. 7, 2020. The UDC, in a separate section, does specify that “timbering and forestry operations are allowed if the tree removal represents tree harvesting undertaken as a bona fide agricultural activity.” The code spells out how such harvesting can be carried out. The code section further specifies: “A preliminary plat for any type of subdivision or a site plan for any type of multi-family or nonresidential development shall not be approved if any portion of the property has been cleared of trees within 3 years prior to such approval request. In a letter dated April 4, Lawson told the county that “The tree removal occurred as a bona fide agricultural activity, as a common forestry practice” and asked that the moratorium be waived. I obtained the correspondence involving the Briarwood Baptist Church and Rhino permits through an open records request I filed after the DRC meeting on Friday. The video of that session is HERE, and the video of the March 17 session is HERE. The Briarwood Baptist Church plan was the second item on the agenda of the DRC meeting on Friday. Rhino Storage was the final item on March 17 agenda. NOTE: An earlier version of this post listed the owner of the property for Rhino Storage incorrectly. I took the information from the qPublic.net database. Oconee County Chief Appraiser Allen Skinner confirmed on 4/26/2017, that the database entry was wrong. I am sorry for the mistake. as the intention to limit growth to the norther third of Oconee crumbles. challenged in court as the big money continues to come in. People have the right to develop their property but they shouldn't be allowed to ignore the permitting process. I've seen the Baptist site and it looks like hell (sorry, Baptists). I hate to think it will look the same for three years and wouldn't object to their getting a waiver but they and others have to made aware that the rules currently in place aren't there for show. If the commission believes this tree removal was a bona fide agricultural activity, they live in la la land. The developers finally need to follow the rules. Maybe they will start doing so once consequences are enforced. Poorly written law. It only stops people from building structures and leaves the land looking like hell for 3 years. Hard to believe the county did not know these projects were underway.